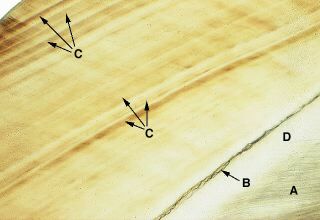 Dentin (A) lies in the lower right corner of the field. The free enamel surface can be seen in the upper left. Enamel rods are not easily discerned here and run at almost right angles to the surface and the D-E junction (B). Dark lines, parallel to one another but occurring at irregular intervals, cross the enamel rods obliquely. These are called the lines of Retzius (C). Identify the specific region indicated by D.